Elder Porphyrios: "Everyone Back! Everyone Back!" Causing the wicked spirits to tremble. 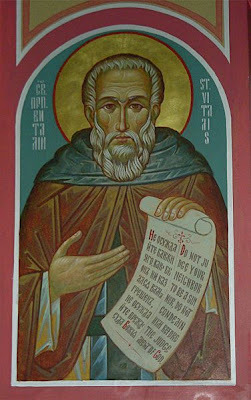 Saint Vitalios, a monk of the Monastery of Saint Seridos, arrived in Alexandria when Saint John the Merciful (November 12) was Patriarch of Alexandria. When he was sixty years old, he undertook an extraordinary task: he wrote down from memory the names of all the prostitutes of Alexandria and he began to pray for them. He worked from morning to evening, earning twelve copper coins each day. In the evening the Saint bought a single bean, which he ate after sunset. Then he would give the rest of the money to one of the harlots, whom he visited at night and said, "I beg you, take this money and do not sin with anyone tonight." Then he stayed with the harlot in her room. While she slept, the Elder spent the whole night at prayer, reading the Psalms, and quietly left in the morning. He did this each day, visiting all the harlots in turn, and he made them promise to keep the purpose of his visit secret. The people of Alexandria, not knowing the truth, became indignant over the monk's behavior, and they reviled him. However, he meekly endured their scorn, and he only asked that they not judge others. The holy prayers of Saint Vitalios saved many fallen women. Some of them went to a monastery, others got married, and others found respectable work. But they were forbidden to tell anyone the reason why they had changed their life, and thereby stop the abuse heaped upon Saint Vitalios. They were bound by an oath they had made to the Saint. When one of the women began to break her oath and stood up to defend the Saint, she fell into a demonic frenzy. After this, the people of Alexandria had no doubt concerning the sinfulness of the monk. Certain of the clergy, scandalized by the behavior of Saint Vitalios, reported him to the holy Patriarch John the Merciful. But the Patriarch did not believe the informers and he said, "Cease to judge, especially monks. Don't you know what happened at the First Synod of Nicaea? Some of the bishops and the clergy brought letters of denunciation against each other to the emperor Constantine the Great (May 21). He commanded that a burning candle be brought, and not even reading the letters, he burned them and said, 'If I had seen with my own eyes a bishop sinning, or a priest, or a monk, then I would have veiled such with his garb, so that no one might see his sin.'" Thus the wise hierarch shamed the calumniators. 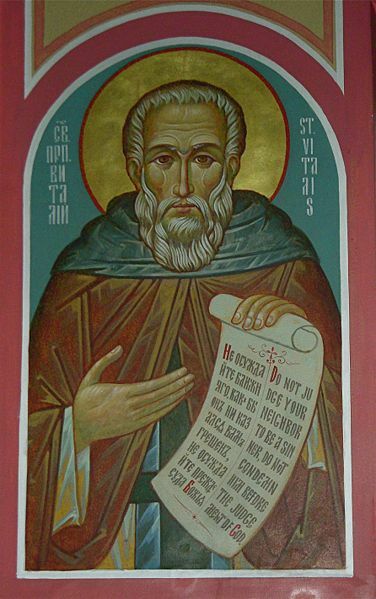 Saint Vitalios continued on with his difficult exploit: appearing himself before people under the guise of a sinner and a prodigal, he led the prodigal to repentance. One time, emerging from a house of ill repute, the Monk encountered a young man going there -- a prodigal fellow, who with an insult struck him on the cheek and cried out that the Monk was a disgrace to the name of Christ. The Monk answered him: "Believe me, that after me, humble man that I be, you also shall receive such a blow on the cheek, that will have all Alexandria thronging to your cry." A certain while afterwards Vitalios settled into a small cell and in it at night he died. At that very hour a terrifying demon appeared before the youth who had struck the Saint, and the demon struck the youth on the cheek and cried out: "Here is a knock from Vitalios." The youth went into a demonic madness. In a frenzy he thrashed about on the ground, tore the clothing from himself and howled so loudly, that a multitude of people gathered. When the youth finally came to his senses after several hours, he then rushed off to the cell of the Monk, calling out: "Have mercy on me, O servant of God, for I have sinned against you." At the door of the cell he came fully to his senses and he told those gathered there about his former encounter with Saint Vitalios. Then the youth knocked on the door of the cell, but he received no answer. When they broke in the door, they then saw that the Monk was dead, on his knees before an icon. In his hand was a scroll with the words: "Men of Alexandria, judge not beforehand, til the Lord comes, the Righteous Judge". At this moment there came up the demon-possessed woman, punished by the Monk for wanting to violate the secret of his exploit. Having touched the body of the Saint, she was healed and told the people about everything that had happened with her. When the women who had been saved by Saint Vitalios learned about his death, they gathered together and told everyone about the virtues and mercy of the Saint. Saint John the Merciful also rejoiced, in that he had not believed the calumniators, and that a righteous man had not been condemned. And then together with the throng of repentant women, converted by Saint Vitalios, the holy Patriarch solemnly conveyed his remains throughout all the city and gave them reverent burial. And from that time many of the Alexandrian people made themselves a promise to judge no one.